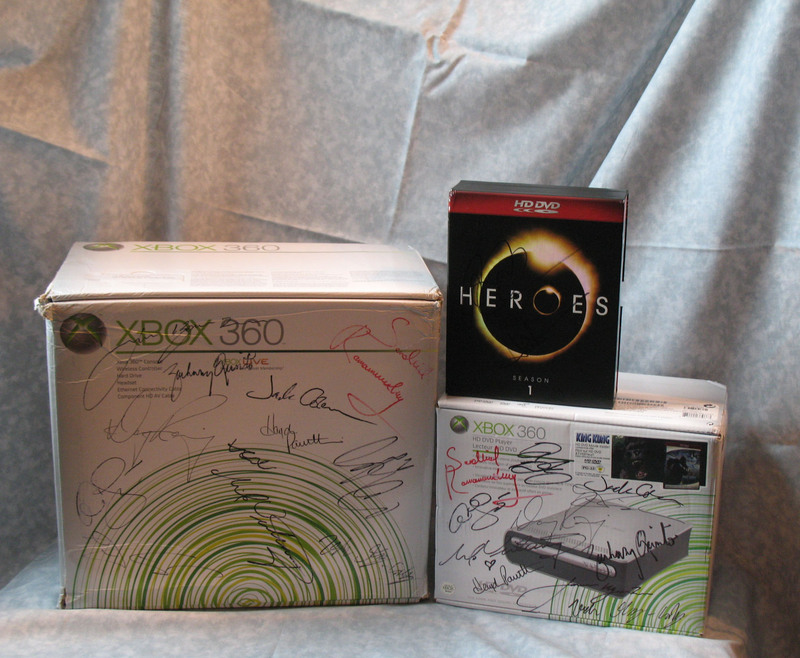 Here are just a few pictures of the huge give away from Major Nelson’s podcast. I entered the contest in December, and found out I won a few days after New Years. The prize pack was shipped out after CES. The trouble was that I was moving out of town – and the package arrived the day after I left. My family has been holding on to the package for me for a while, and I finally had them open it up and take a couple of pictures. So here they are. 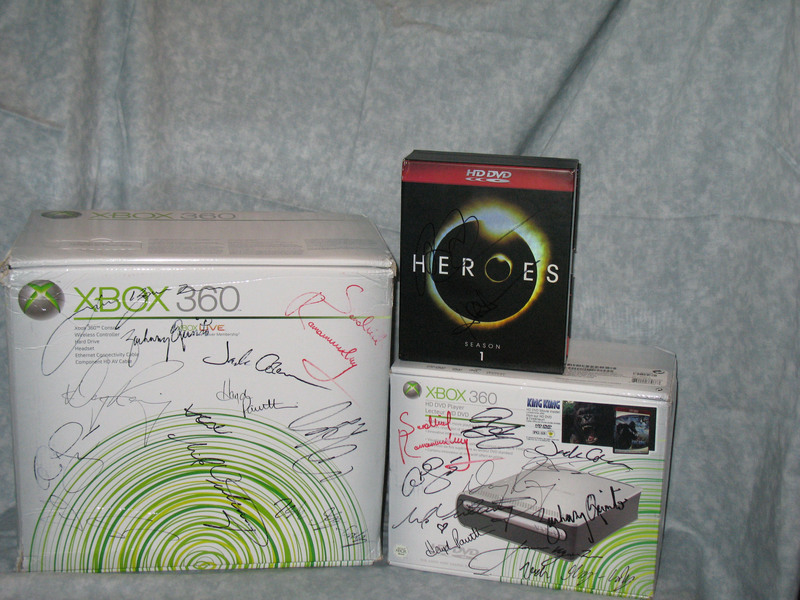 The brand new Xbox 360, the HD-DVD Player, and the First Season of Heroes on HD-DVD… all of which are autographed! Again, I have YET to see these in person, but these glorious photos are amazing, as far as I’m concerned! It’s hard to tell who signed what, especially the DVD’s themselves. I believe that might be Major Nelson and his one time guest, Heroes Co-Executive Producer Jesse Alexander – but I can’t see for sure. 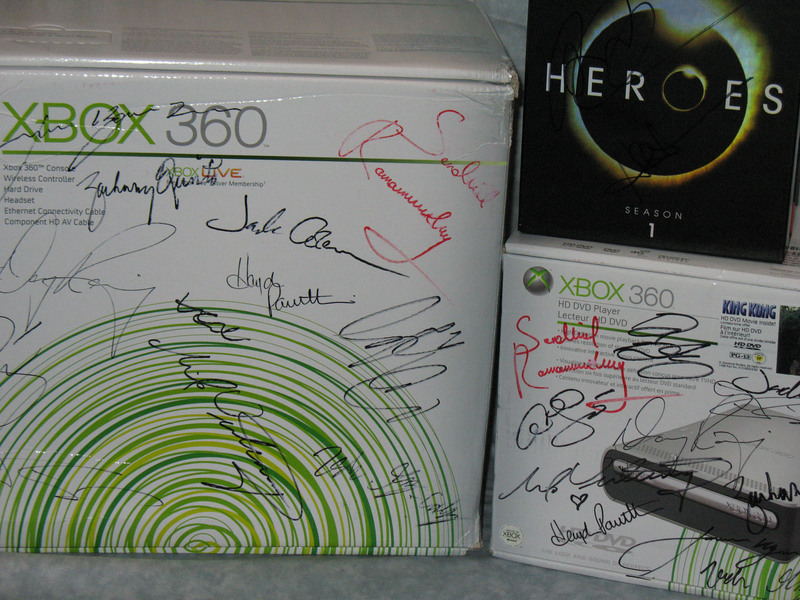 But I’m very excited to see Sendhil Ramamurthy, Jack Coleman, Hayden Panettiere, and so many more of the Heroes team!! I probably won’t have this thing in hand until April – and then it will be a long process of deciding whether this goes in my collection, becomes a give away for my website, or if it goes on eBay with the proceeds going to Child’s Play (the last one being highest in my mind, at this time). All of these thoughts have crossed my mind, and it’s a good thing I have a few months to decide! Until then, enjoy the pictures! If you want the audio, I have to say I’m sorry, I don’t have it. I had recording software running, redundancy in place, multiple ways of recording – and unfortunately, the stream I was listening to was underpowered and often too quiet. If you want to take a listen, head on over to MajorNelson.com – he will be uploading it in the next few minutes. I want to thank TXPaladin, who was the only one who sat around with me tonight and listened to the show and chatted about it with me. It was a fun experience, and with my mid-show investment into ShoutMix.com, I hope I get to use the new shoutbox even more in the future! Yeah, the free version had way too many limitations that I didn’t know about until we got into the swing of things… but it all worked out in the end, so thanks for standing by even in the moments of technical difficulties. With so little in the way of Xbox, I don’t intend to do any major write up for this, but below are my notes that I took and some of the things that I typed into my ShoutMix while listening to the show. Enjoy. Sound quality is terrible… very quiet, will have to normalize audio before uploading these streams to my readers. 11 appearances @ CES, 10th keynote, 8th in a row. Video intro for Gates… to the tune of “do you believe in magic” … quickly switched to t echno-pop remix of the song. On stage in traditional blue sweater. First keynote right when Windows 95 was first coming together, 1994. The first digital decade. Bill will talk about the NEXT digital decade. (WinBreak.com’s SHOUTMIX SHOUTBOX went down for 3 minutes – WinBreak CentCom staffers recovered quickly). Conversation begins on second digital decade. User centric, and connecting people. “High Definition experiences everywhere.” Media room tables, projectors on walls, the Surface, etc… more rich 3d environments. Rich devices “service connected.” Getting software updates, data, etc… taking a photo on a phone and having it on the web made even easier. So simple you take it for granted. “Power of ‘natural user interface. '” Keyboard and Mouse going by the wayside. These are the primary 3 elements that will make up the next digital decade. Still pluggin home automation… Jetson’s was supposed to be the year 1999… we’re behind schedule. Vista is a year old, 100 million user milestone. 420+ million of people using Windows Live Services. Windows Mobile 10 million new years last year, expected to DOUBLE to 20 million this year. Mika Krammer Windows Live team. Calls Windows her lifeline, and talks about the use of Windows Live ID. Gates uses Surface to design his own snowboard. Nothing really that new pertaining to surface so far. It allows you to interface your phone with it and use it to deliver pictures and datas to the web. Plugging Silverlight. New partner: NBC has chosen Microsoft as its exclusive Olympic partner. Big surprise from “MS-NBC” joint venture! NBC’s perspective: extra video. Most ambitious and comprehensive broadband video coverage ever. The music is overpowering all dialogue. Live tops 10 million members – months ahead of schedule! ABC and Disney bringing TV shows to XBLM this month. Xbox Live will have more on demand video than any current cable or satellite providers, later this year. Talk about media center extender. Interactive IPTV, select your fixed camera during a live event. British telecom will provide the set top box, first. Off to the ZUNE news. Finally will start selling Zune in Canada this spring. Molly O’Donnel to talk about Zune Social (beta). Major reminds us that Molly was shown in the December “inside Xbox” holiday video. An easier way to sync to the unit, much better than just using last.fm. Benefits to Microsoft Sync in the Lincoln MKX. 911 assist coming to Sync. 911 called when airbag deployed. Very handy. Take that, On*Star. 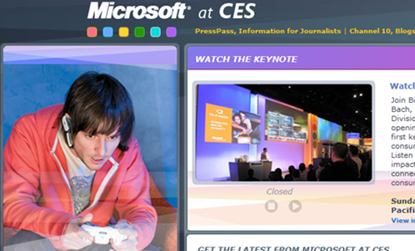 Tellme, a Microsoft Subsidiary. 411 style. Is 1800-Goog-411 in trouble? Press To Talk, how to use Tellme – to search for movie theaters in the area, show times, tickets, buy tickets, AND share them with someone in your contacts list. Looking ‘ahead’ with Bill Gates and Robbie Bach. Screen image CLEARLY simulated of new “vision tool” which he can point to something or someone. As it gets recognized, it will show details or notes you’ve made. Integrates captured scenes and images with live earth 3d. Gates and Bach, in vegas, may bet $20 on GH3 round. TipperQueen takes the place of Bach – SLASH takes the place of gates (no GH3 guitar for him). Slash plays Bach (and self) off stage. Generic music and background video come back… end of keynote? Very lackluster, considering last year’s big announcements of IP TV for the Xbox, etc… . As always, thanks for stopin’ by at WinBreak, and even for showing interest in my CES write up! 🙂 It gives me hope for my little startup, yet! Live coverage of the CES Keynote, tonight! For those of you geeky enough to care, but not geeky enough to be so dedicated to sit around and listen to Bill Gates and friends run around a stage to crappy rock music, I will be covering the event LIVE, with a post keynote summary. My live coverage will be courtesy of that awesome shoutmix.com shoutbox you now see on the right side of the index page. Now I’m sure you would all rather follow Major Nelson’s twitter, but mine at least offers a little bit of interactivity during the show, as you’ll be able to chat with me while I do it! 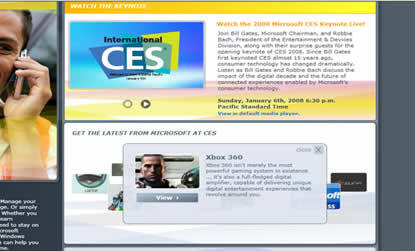 Posted in GamingTagged CES, Microsoft, xbox 3601 Comment on Live coverage of the CES Keynote, tonight!